This topic contains 5 replies, has 3 voices, and was last updated by Stephen Madjanovich 5 months, 3 weeks ago. Not rules related exactly but looking for information, links to sites or threads, or books. 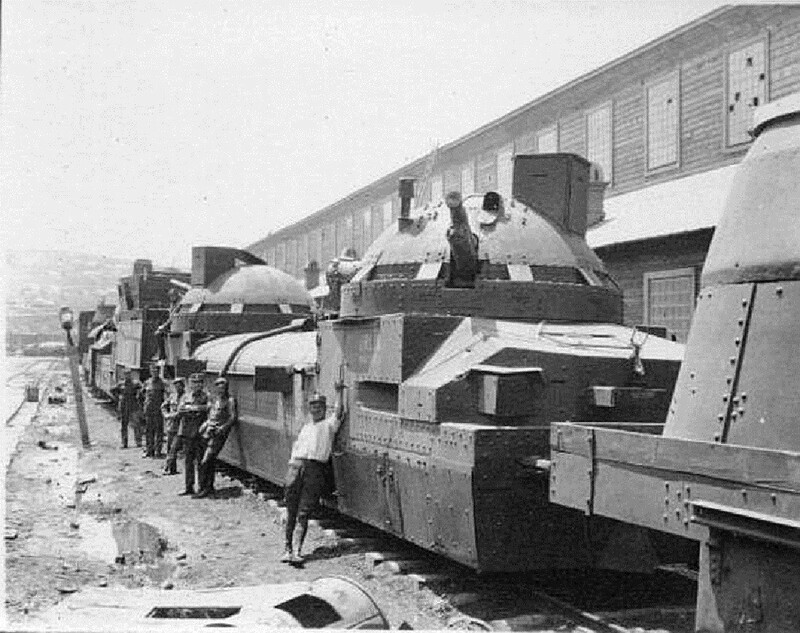 I am curious about the employment and effectiveness of armoured trains in the Russian Civil War. I understand the attractiveness, even have one in 6mm myself. The dreadnought of the land or early 20th century O.G.R.E.s. Having watched Lawrence of Arabia many times I wonder how they managed to survive and how they were used. To my mind the primary weakness is the rails, seeming easily to cut or blow a bridge over a river. Time it so the train is still moving at or near the cut or bridge and now the train is off the rails, in the drink or worse. As I see it here are some possible ways armoured trains could survive. The railroads are so important to both sides no one dares damage them too much. Sure block travel but don’t break it so it can’t be fixed. Demolitions and experts to perform such tasks were so rare as to be little concern. The trains moved so slowly they had time and space to react before they ran off the rails. If this is the case then other than use as slightly mobile pill boxes or 24 hour a day “marches” I see little use for armoured trains. Why not just use regular trains? This option would also allow the use of screening forces, say cavalry scouts riding ahead of the train ready to trot back to the train if opposition is discovered. Again you are reducing the mobility of the trains and now the number of troops, and animals, is a burden on the supplies the train is required to support. They only worked behind friendly lines. Since the RCW like most 20th century wars were so very fluid I don’t see this as a reason. If so what use would they be militarily? Mobile terror platforms keeping the locals under your thumb, much like in Dr. Zhivago? Slaughter a town you suspect of aiding the enemy as a warning to others on the right of way. Sounds suitably communistic but a regular train full of soldiers could do the same job. They were so big and powerful they were the 1920s incarnation of the O.G.R.E. If they had hundreds to thousand of troops they could be truly mobile divisions. With those numbers of workers and carrying sufficient repair supplies you could fix anything short of a destroyed major river crossing within a week. You could also fight off very concentrated attacks. But then you are putting “all your eggs in one basket” and stripping forces which may be needed elsewhere. Am I missing something? There seems to have been a number (approaching 100?) built during the RCW so if the idea was not valid or tactics were worked up to counter them I expect to see them die off. Instead every country in Europe seems to have developed them and utilized them in the next big punch up. If you have an answer please tell us. If you have some suggested reading, or web sites or threads which address this please post links. Thank you. Their use was a lot more flexible than you might think. There were a number of occasions when they were used in the vanguard of an assault, steaming into a town with the first waves of attackers, providing immediate heavy support. There were a number of duels between trains on parallel tracks, which must have been a little like the ACW ironclads to witness. Then there was artillery support etc. They worked alongside cavalry units, providing a ‘base’ and fire support. This reply was modified 6 months ago by Etranger. Armored Trains by Steven Zaloga (Osprey Publications). 48 pages concentrating mainly on the development and deployment of trains in Europe. Armoured Trains – An Illustrated Encyclopedia 1825-2016, by Paul Malmassari. 528 pages of armoured train heaven. As the title suggests, this is an encyclopedic approach to the subject. Every country that has ever employed armoured trains is covered, with photographs, plans or drawings of almost every, if not every, armoured train that has ever existed. I have other books that cover only German armoured trains of WII, but since I think you are really interested in the Russian Civil War I would suggest getting Zaloga’s book first. It’s a lot cheaper than the others and looks at the use of these trains in the RCW to a reasonable degree. This site is not allowing me to post a sum up new reply! I don’t know why it isn’t letting me post here. Maybe too long? Here is a link to the same post on a different forum. Some excellent replies and follow ups. Please see the topic in the previous post immediately prior.